Standing on the Giza plateau (Giza Necropolis) on the west bank of the Nile River in Northern Egypt stand three huge ancient Egyptian Pyramids. The biggest is the famous Great Pyramid which is one of the Seven Wonders of the Ancient World. The smallest pyramid of the three, and the last of the three to be built, is the Pyramid of Menkaure; an amazing architectural accomplishment for the ancient Egyptian people. Pharaoh Menkaure, who had this pyramid built, reigned over ancient Egypt for about 20 years starting around 2530 BC. He was the sixth ruler of ancient Egypt's fourth dynasty. 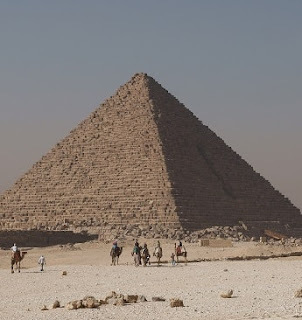 On this page we list interesting facts, written for both kids and adults, about this pyramid. Information includes who built it, when it was built, and where it is located. With an original height of 215 feet (65.5 meters) the Pyramid of Menkaure is less than half the height of the Great Pyramid at Giza which had an original height of 481 feet (146.6 meters). The height of the pyramid is now 204 feet (61 meters). Centuries of erosion and sinking into the sand have led to the decrease in height. Pharaoh Menkaure's pyramid base measures 338 feet (103.4 meters). The lower portion of the pyramid was sheathed in red granite whereas the upper portion consisted of white limestone. This is in contrast to the Great Pyramid which was sheathed with all limestone. The Pyramid of Menkaure is what is defined as a "true pyramid" meaning it is a pyramid with smooth sides; this was an improvement in construction for the ancient Egyptian people over earlier step periods. Exactly when this pyramid was built is not known, but it is widely believed to have been completed in the 26th century BC. Menkaure was the son of Khafra the builder of the second largest pyramid at Giza and the grandson of Khufu who built the largest pyramid at Giza; the Great Pyramid. Although Menkaure's pyramid was much smaller than the Great Pyramid, also on the Giza plateau, his mortuary temple was grander than that of the Great Pyramid. Mortuary temples were separate structures built near or adjacent to a pharaoh's tomb or pyramid. Near the Pyramid of Menkaure stand 3 satellite pyramids called the Queen's Pyramids; construction on all three was never completed. Within the pyramid a beautiful detailed sarcophagus was discovered which was believed to be Menkaures. Unfortunately, in the early 1800s, while it was being transported to England for examination the ship it was on, named Beatrice, sunk in the Mediterranean Sea. The sarcophagus was never recovered. On the north side of the pyramid is a long vertical gash. This large gash was created by an attempt to demolish the pyramids at Giza, starting with the Pyramid of Menkaure. This demolition was ordered by a Kurdish ruler by the name of Al-Malik Al-Aziz Osman bin Salahadin Yusuf in the late twelfth century. Luckily the job of dismantling the pyramids was extremely difficult and the attempt was abandoned. Just who was the main architect of this amazing pyramid is not certain. It is very likely that Menkaure's brother and Vizier (the highest official to serve the Pharaoh) was in charge of its design and construction.